Well, who in the world will hate traveling? Traveling is always whether it is a family trip or your adventurous trip or traveling with friends. Whenever I think of traveling, there is always a smile on my face, Thinking of a trip to a hill station, or going out with family or traveling to foreign countries. Travelling is fun, but think, you are at Airport, about to board, but crap! Your suitcase is in a bad condition, you will definitely feel bad. We are here for you with a guide to choosing the best vintage-inspired luggage bags for you with few suggestions from our side. When it comes to looking, the vintage bags inspired from 1930-40s are the dopest series of suitcases and carry-ons. With the modern security and features and looks inspired by vintage bags, you will get a perfect luggage for you. Finding a perfect bag can be really tricky, and when it comes to vintage style luggage, there are piles of choices and hence getting a perfect pick will be even harder. 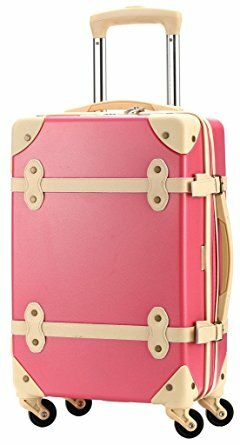 So here we present you the complete guide to choosing best vintage-style luggage for you and also picked best one from our side to fulfill best of your needs. 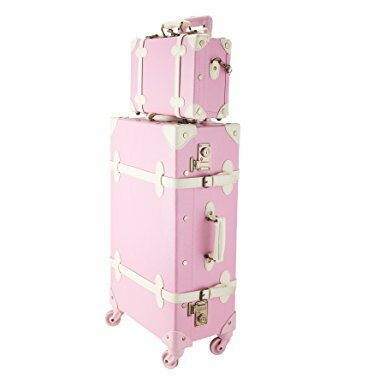 Later in the article, you will find the list of 10 best vintage-inspired luggage and their features, pros, and cons. We know that whenever it’s about bags, there is a long long list of available bags that makes the task to find the perfect bag for your need. 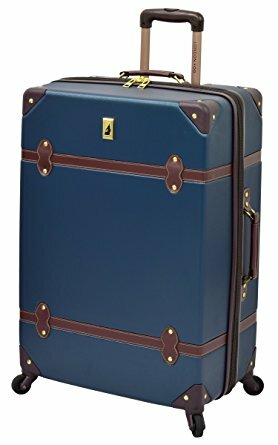 There are various points which you need to keep in mind before buying a vintage-inspired luggage. You will have the check if the luggage is secure enough so you can keep your valuables in it without any issue. Looks matters a lot too, your bag should look good enough to bring some attention to it. Anyway, the lists of vintage bags we are going to provide to you are all dope look wise so don’t worry. We will provide you with the points to remember while choosing the correct bag for you so that you can choose wisely. You should know that old boring packing can also be fun with a dope vintage bag. Well, a safe bag with efficiency and look can be tough to find but we are here to take that responsibility so that you can have a stress-free and fun ride. We are providing you with the best vintage-inspired bags but you will have to choose the best one and perfect match for you because you can’t buy them all: p. So here are few tips to help you choose the best pick for you. Choosing the right secure vintage-inspired luggage would be overwhelming, because of the pile of choices available in the market. Why get back in time when you can get dope vintage style bags under your fingertips. Firstly, you should consider what size of the bag will be a perfect match for you that depends on what size matches the best for your trip. This depends on how constantly you travel and how long. Whether you go on business trips or go with your family and friends. What you usually take with you wherever you go and what space you want for your accessories. Like if you want to go on a trip where you will have to walk a lot, you should pack as light as possible and should choose a light portable vintage-inspired bag. Secondly, your bag should be tough enough to last long enough to not let you down on your trip. This mostly depends on what your bag is made up of i.e. is the material company used to make it tough and strong enough to last longer than other bags. Bags should be strong enough to make sure your valuables are safe. Leather bags are no doubt the strongest ones, and with some integration, they make outlasting peace of bag that is more than your expectations. Well, faux leather and polycarbonate ones are also tough enough so it’s just on you which one is the perfect fit for you. It depends on efficiency, looks and your necessity. And of course, style matters a lot too. Certainly, Bag should be helping you to lessen the burden you carry rather than itself being a burden for you. You just need a helping hand with your luggage, not a burden 😛 traveling around with a huge heavy bag will not be considered wise choice for you. So you better look for the weight of bag before choosing one for yourself. So look for a bag that is light enough to make your trip easy and comfortable. We will be providing you with the Amazon links for our picks so you will definitely be finding weights of every bag on respective Amazon pages so choose wisely for yourself. Remember; never ever go for a heavy bulky bag just because of looks because ease to move with matters a lot too. 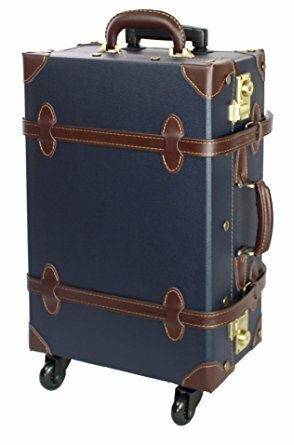 We surely are looking for vintage-inspired luggage here but that doesn’t mean you should compromise with current features for that. You should always look for a bag with latest and best helpful features to help you around on your trips. A feature doesn’t only mean ease but also latest security features to help you on your rides. Look for bags with more and easily accessible compartments and best quality zippers. Look for a bag that is well equipped to satisfy your needs. As here we are looking for a vintage-inspired bag, which no doubt are dope and catchy so you won’t have to worry much about design but that does not mean that you should be completely carefree. You definitely should look for design and bulkiness of the bag. If you are going on business trips, you should consider a handy small bag that is easy to carry around where ever you go. If you are going to travel long, look for spacious bags with the capacity to hold your basic needs that you would require on your rides. Also, keep in mind how you are going to carry the bag around with you, whether it has lumbar support and padded shoulders for best of your comfort. When it’s about traveling far from your home, it is important to keep in mind to purchase a durable bag so you will never have to worry about your bag during the trip. This depends mainly on the material used about which we have mentioned earlier. Don’t go for a cheap quality bag just to save a few bucks. Though the vintage-inspired bags are best in terms of style as they are catchy even in crowds. Vintage style modern bags never compromise with the look but still why not try to get the best one for you? Get the best one that perfectly matches your personality. Pick an eye catchy color and try to pick a unique design. Anyway, in case of vintage-inspired luggage, you will not have to worry much about the looks, leave it on the bags inspired by retro bag looks. Well, why to waste a single penny when you can get a decent bag on a decent budget. Anyway if you are low on budget, consider for a bag in that range but should be good enough to meet your needs. But if budget isn’t your concern, go for the gold. Increase your budget if you cannot get a good bag in your budget but don’t buy a waste or you will regret later. Although there are various types of bags available in the market from all different brands the one that will suit you is a little difficult to find. But my friend you should not worry at all because we have separately brought to you features, pros and cons of 6 best bags in the market, out of which one would be the best for you keeping in mind all the points, pros, and cons. Here we go with those bags. This bad from London Fog is made up of PU with hard crafted stitching. It has 4 Heavy duty spinner wheels. The package includes a 24’’ suitcase with approx. 37L of volume. It has perfectly organized pockets inside the suitcase for better storage and security. Includes a 24’’ suitcase with approx. 37L of volume and a 12’’ handbag with approx. 5L of volume. The superior and deluxe quality are guaranteed by the company. The colors on its case would vanish after some time. This bag from the world famous brand Ambassador is a lightweight suitcase is made of 100% Bayer nylon and polycarbonate material that can manage high temperatures, extreme moisture, and impact resistance to be one of the highly recommended carry bag/suitcases at this price point. Let’s have a look at its other features. Interior dimensions are 24" x 16.5" x 10"
Interior dimensions are 19" x 13.5" x 8.5"
The quick access compartment opens horizontally instead of vertically. 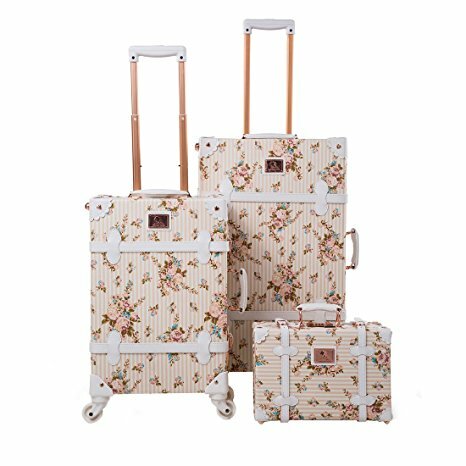 These three bags from Uniwalker are especially for women that they can use for travel and other purposes as well. It is made of polyester and has a polyester lining, both inside and outside. The Retro 3 password lock makes it easy to set or reset your password and protects your suitcase from theft and pickpockets as well. Let’s have a look at its other features. Partial waterproof and easy to clean. You could only use stipe to wash the outside. American SJ.TOBOL's high-quality wheels with super sound-off, built in bearing. Although the wheels are made off TPSIV Injection molding silica gel, which is elastic and wear-resisting. Don't worry about that it will be dirty. The Retro 3 password lock makes it easy to set or reset your password and protects your suitcase from theft and pickpockets as well. The lightweight aluminum material makes it anti-compression ability and smooth lifting. Multi-gear design can meet the needs of different groups of people. The design on its case would vanish after some time. The hooks are of cheap quality, so can be easily damaged. 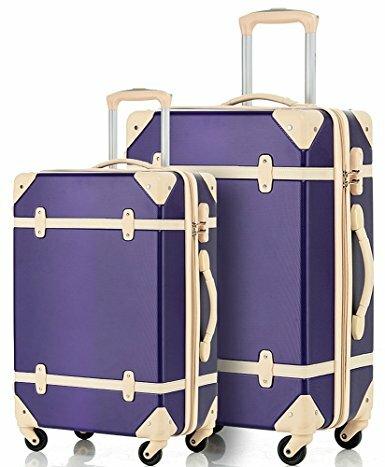 This Merax Travel house 2 Piece ABS Luggage Set Vintage Suitcase is good looking and worth the value product, so in case your budget is low and you are looking for a cheaper bag than the previous ones than this would be a perfect choice for you. Three color combinations: carmine pink with ivory trim, blue with rose trim, and purple with ivory trim. The hard side spinners are made up of aluminum with a push button for extending and erecting the handle. Medium Suitcase: 24 x 17 x 10 inches; weight: 9.4 lbs. Small Suitcase: 20 x 13 x 9 inches; weight: 7.1 lbs. This one is a classic vintage bag that comes in various different colors with a mind-blowing gorgeous design and trim. It comes in three different sizes you can choose one of them. Let’s have a look at its other features. The expandable handle can be locked at any height between the maximum and minimum. Spinner wheels allow you to easily slide the bag. Dimensions of the small suitcase: 12.20 x 20.50 x 7.50 inches; weight: 8.8 lbs. The small ones are way too smaller so you should get the medium sized bag instead. When you travel the first thing that is required after tickets are the bag that you carry with you and take all your clothes, daily needs, and valuables in this bag. So, you need to be very clear and have a proper idea of the bag that you should buy. Although you may or may not want a bag same purpose every time, so we have given have some useful tips that you should keep in mind while buying a luggage that is totally safe and secured. Along with that, we have also written down the 10 best vintage-inspired luggage bags that you should consider buying for your different tours and travels.